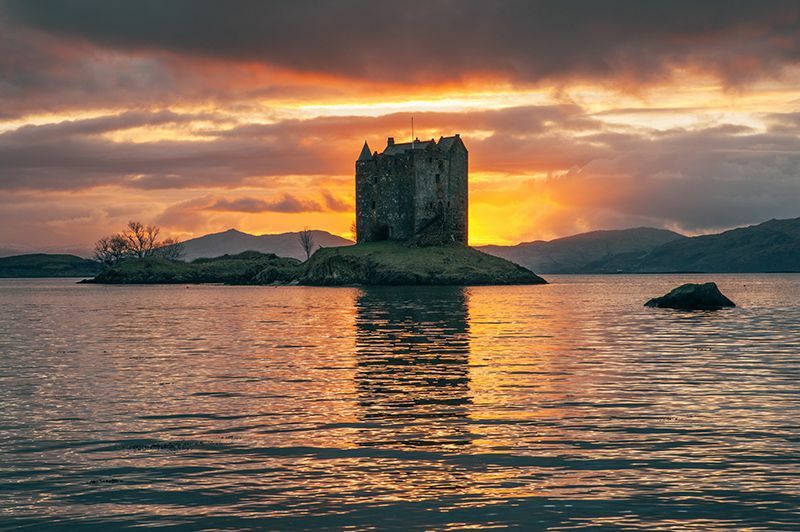 The Scottish Highlands: a wild, rugged landscape, dotted with ancient lochs, mystical islands and snow-capped mountains. 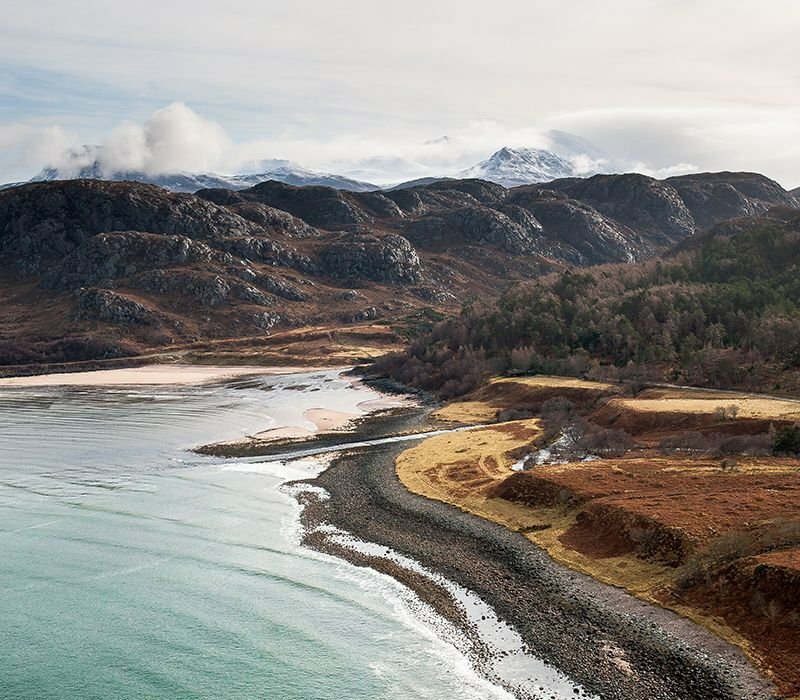 This corner of paradise is too often overlooked by photographers, who’d rather head to Scandinavia in search of the Aurora Borealis or to the European Alps, for predictable weather and the highest peaks. Having been to the Highlands for 10 days in December 2014, I left making a promise to myself: I’d return. Keeping to my word, I set out on the long journey north, with my new Pro Light Camera backpack in tow. 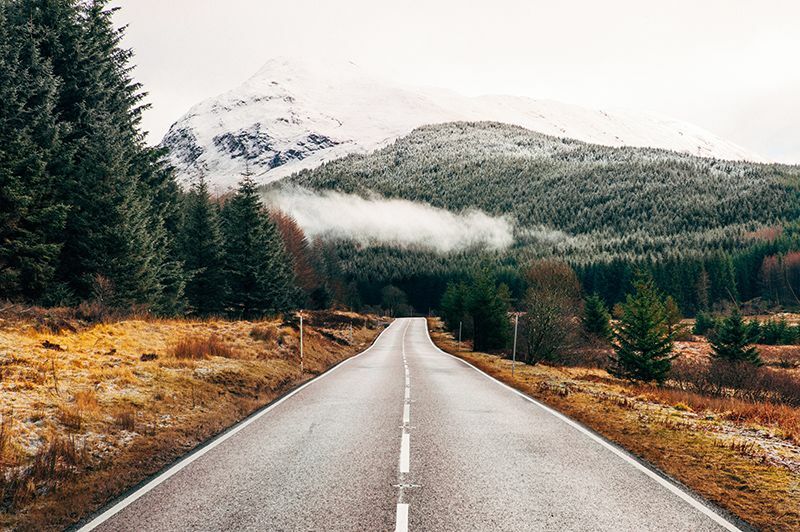 Flight cancellations and transport nightmares aside, my second jaunt around the Highlands was everything and more that I’d hoped it’d be. 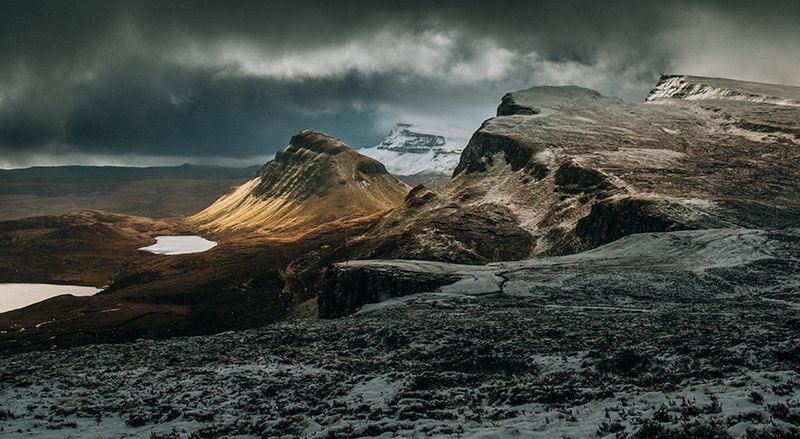 Moody skies, incredible light and of course, the traditional Scottish welcome: blizzards! I’ll focus on one singular day, the most special out of all: exploring the photographical gems on the Isle of Skye. 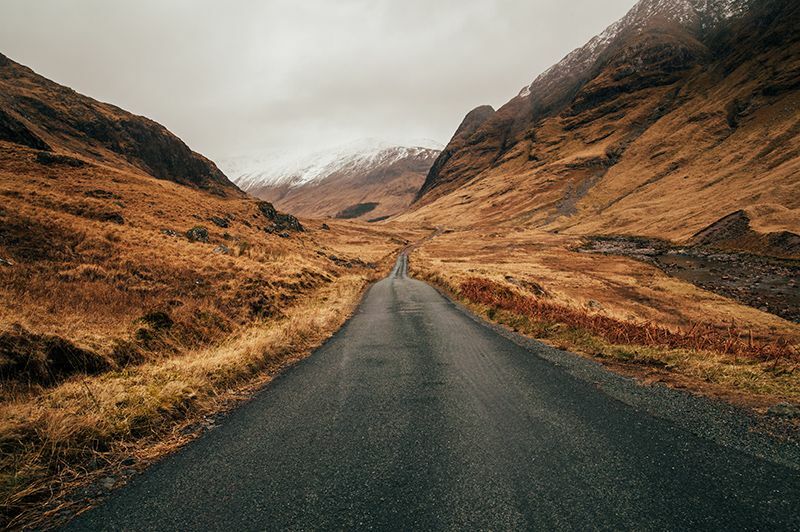 This island is an absolute dream for a photographer; from dramatic waterfalls through to sharp, jagged snow-capped mountains, Skye has it all within a (relatively) small space. After arriving late the night before, we (myself and a photographer friend) woke up at the unsociable hour of 5am, ready to drive north to the famous Quiraing – a giant ancient landslide – for sunrise. Bag packed with a 17-35mm f/2.8 and a variety of lenses, we set off. Despite a promising start with good light to the east, conditions soon changed. As we hiked up the back of the land formation, waves of rain/hail/snow lashed us as we climbed higher. Not to be deterred, I put the waterproof cover over my pack and upward we continued. While the view was epic to the human eye, the conditions were so bad we were unable to get any shots – all part of the fun on Skye! 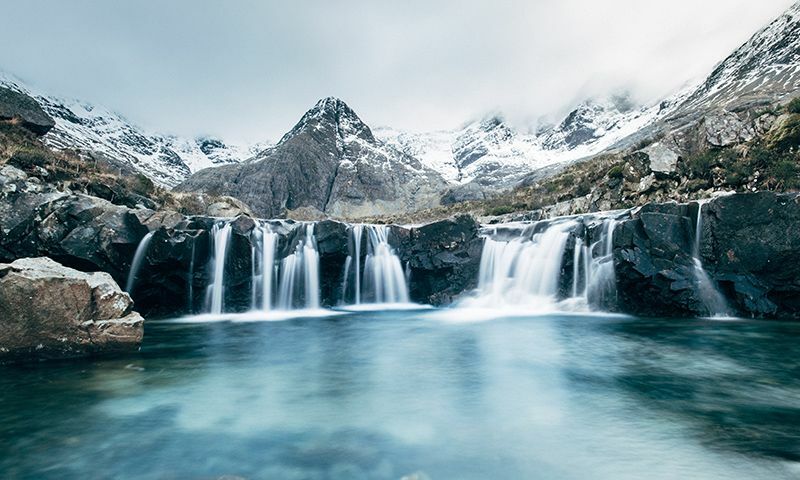 We hoped back into the car and headed south to the Fairy Pools, a network of streams and rivers come from the intimidating Cuillin Hills, an alpine-like mountain formation. The weather there was immeasurably better, with flat overcast skies and little-to-no rain. With my Pro Light repacked – this time with the 17-35 f/2.8 and a 24-70 f/2.8, we began the 2 mile hike down to the pools. On getting there, we were met by the gorgeous deep blue pools of the area. One word: wow. This took me back to my trip to the Blue Pools of Haast Pass in New Zealand last year… only 20c colder! We were keen to get off the ‘tourist’ path and shoot streams/waterfalls never seen, or at least very infrequently. Spoilt for choice, we waded across many rivers (trying not to sleep on the algae-covered rocks!) for hours. Eventually coming across a small ravine, we put the bags down, got our gear and shot away. After a while, the sun began to set. We weren’t hopefully for a display of colour as the conditions on Skye (and in Scotland more generally) can change in literally minutes. However, this time round we were treated to some lovely pink hues. Quite subtle but beautiful nonetheless. After a dire morning, the Fairy Pools definitely more than made up for it. Driving back to the hotel in Portree – Skye’s capital – I was satisfied with the day’s work. 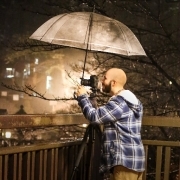 This was the first time using my Pro Light Bag in tough conditions and I couldn’t have been more pleased; not a single drop of moisture on any of my lenses or bodies! 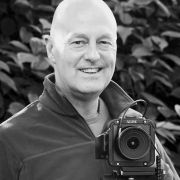 George Turner is a travel and wildlife photographer based in the South of England. 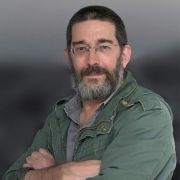 His path to becoming a photographer is far from ordinary, as he was originally as a Strategist/Planner in traditional advertising for many years, working with brands such as Absolut, Marc Jacobs, Jameson, Calvin Klein and Coca Cola. Travelling whenever he could, his passion in photography grew and grew. He eventually decided to take the plunge in 2015 and now works with various tourism boards and brands within the tourism sector. His main passions are telling the stories behind the world’s most endangered animals, including a project on the Iberian Lynx in Southern Spain in 2016.